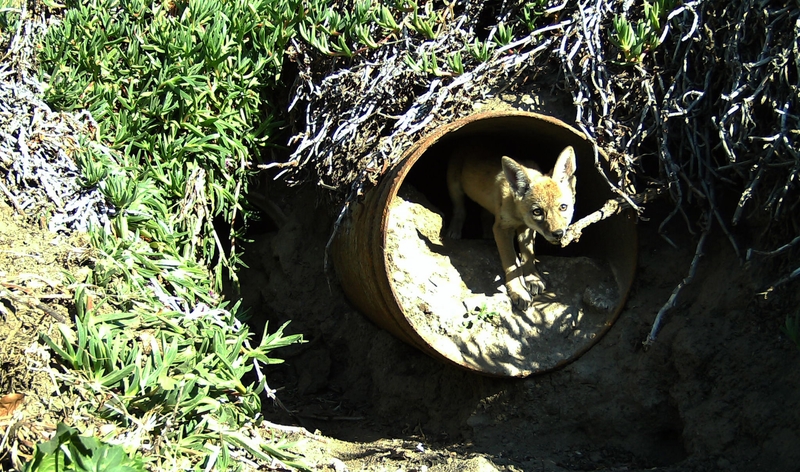 A coyote pup is captured on a game camera in Irvine. 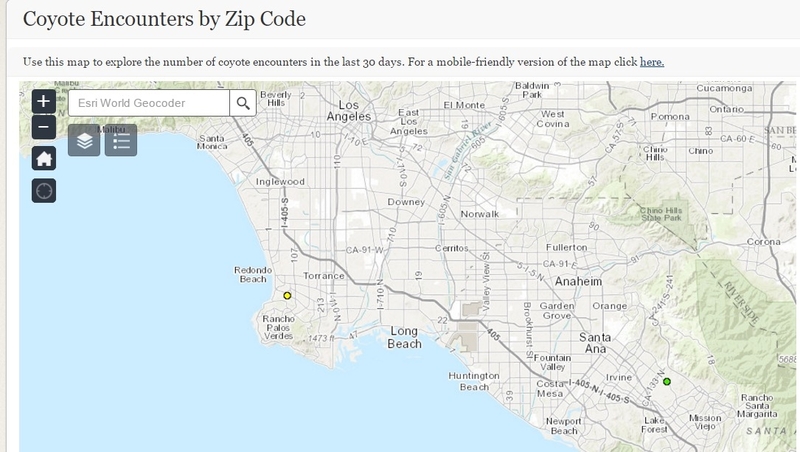 Hikers can use the Coyote Cacher app to report coyote sightings. As urban coyote numbers rise, the animals are increasingly crossing paths with residents. There have been police reports of coyotes attacking pets and even people, but there has been no place to report casual coyote encounters. Now there is a new mobile app to help keep track of where those wily coyotes are coming into contact with people. 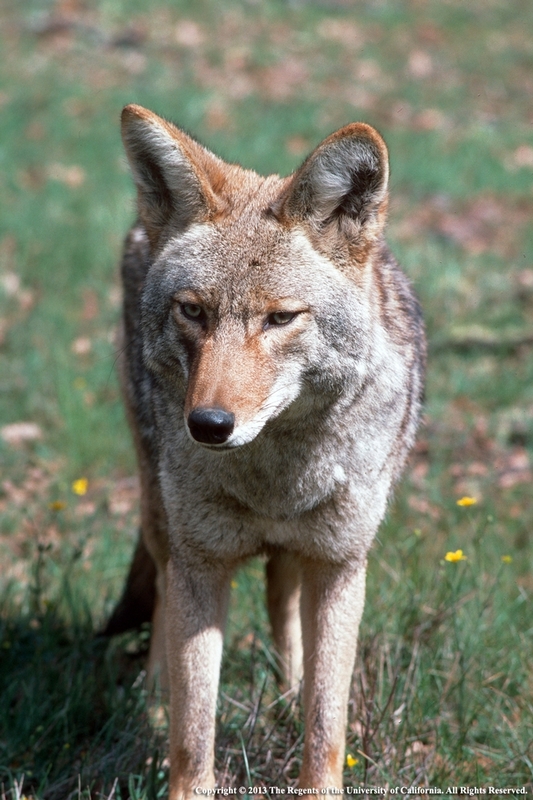 Hikers and people walking their dogs can use Coyote Cacher, created by the University of California Agriculture and Natural Resources, to report coyote sightings. By reporting encounters with coyotes in their neighborhoods, residents can share information to help neighbors keep their pets and children safe. “There is a coyote encounter map that will allow the public to keep track of what is happening in their areas,” said Quinn, who is based in Orange County. 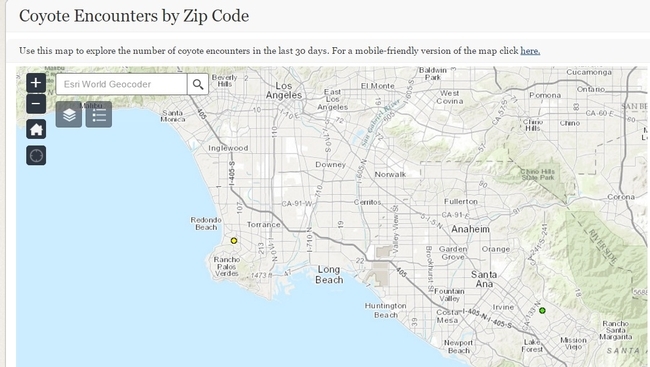 Individuals can use the app to check a map to see locations of coyote sightings. Pet owners may decide not to let their pets out at night unsupervised in areas where coyotes have been reported. Coyote Cacher's map shows locations of coyote encounters. Green dots are the lowest level alert, yellow indicates a pet interaction and red, the most serious, warns of an attack on a pet on a leash or person. Green is the lowest alert level and will give alerts for all coyote encounters in the user's zip code, from sightings to a person being bitten. Yellow will not alert users about sightings, but will let them know about all levels of pet interactions, including pets being chased or attacked off-leash by coyotes, and red alerts. Red is the highest alert level and allows for users to be informed only about the more serious incidents, for example, a coyote attacking a pet on a leash or biting a person. “This app will also allow me to gather baseline information on coyote activity and the success of community hazing,” Quinn said. Community hazing involves people shouting and waving their arms at coyotes and generally being obnoxious to make the nuisance animals afraid of humans. More intense hazing, like shooting them with paintball guns, might be more effective techniques for government agencies to manage urban coyotes, she said. To find out if any of these techniques work, the UC wildlife scientist would like to put collars on urban coyotes to study whether the animals move away from locations after hazing. Quinn would like to put collars on urban coyotes to study whether the animals move away from locations after hazing. 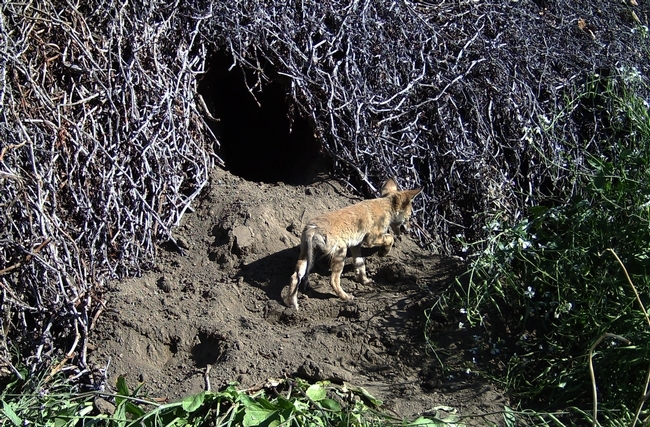 Although Quinn's research is focused on California, Coyote Cacher can be used anywhere in the United States. The website also offers information about urban coyotes. Coyote Cacher can be used on a computer or on a mobile device at http://ucanr.edu/CoyoteCacher. The Coyote Cacher app was designed by UC ANR's Informatics and Geographic Information Systems and funded by UC Cooperative Extension in Orange County. Some coyotes have adapted to urban environments, creating a need for outreach and managing coyote-human conflicts. Wildlife and people have been in the news lately. Perhaps you've heard of coyotes wandering in urban neighborhoods. You might have also read why you shouldn't feed wildlife. Did you know they are connected? It's a problem when people feed coyotes either intentionally or unintentionally by leaving garbage uncovered or pet food outdoors. Readily available food may encourage coyotes to lose their natural fear of humans. These interactions will be discussed during a symposium on urban coyotes at the 27th Vertebrate Pest Conference, March 7-10 in Newport Beach. The Vertebrate Pest Conference is held every two years, usually in California, in cooperation with the Pesticide Applicators Professional Association (PAPA). The leading authorities with vertebrate management expertise from around the world congregate to present the latest research and extension information. The conference is intended for animal control officials, wildlife managers, agricultural producers, pest control advisers, consultants, educators, researchers and natural resource managers. California Department of Pesticide Regulation and California Department of Public Health continuing education units are available for participants. Special symposia at the conference include bird, wild pig, and urban coyote management. At the Vertebrate Pest Conference, experts will share the latest information about coyote attacks, human-coyote conflicts, and present several talks on coyote management, including hazing. Niamh Quinn, a UC Cooperative Extension vertebrate pest advisor based at the UC South Coast Research and Extension Center in Orange County, is one speaker on the growing problem of urban coyotes. With over 3 million people in Orange County, 8 state parks and beaches, countless city parks and 19 county parks and wilderness areas, conflicts with urban coyotes are bound to happen. Managing coyotes includes managing people's behavior too. 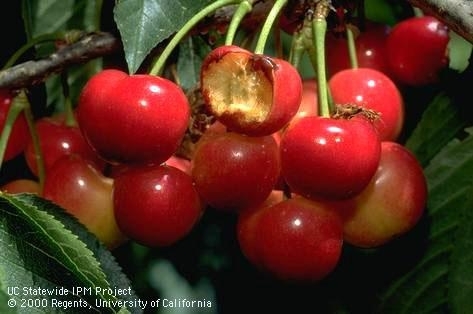 Bird damage to ripe Rainier cherries. Vertebrates are also problematic in commercial agriculture. 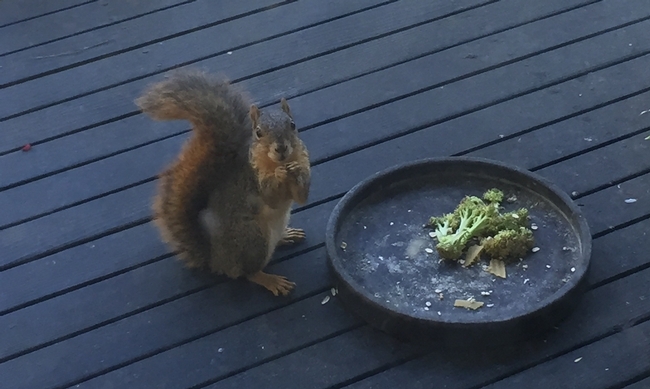 A 2011 survey of wildlife damage by UC Cooperative Extension specialist on human-wildlife conflict resolution, Roger Baldwin, said agricultural losses from wildlife damage in California is likely in excess of $1 billion annually. Based on the survey results, economic losses were greatest for voles and pocket gophers in alfalfa; and wild pigs, birds, and ground squirrels in nut crops. One talk at the Vertebrate Pest Conference will be a North American overview of bird damage in fruit crops. Other presentations cover field rodent repellents, food safety, and trapping.